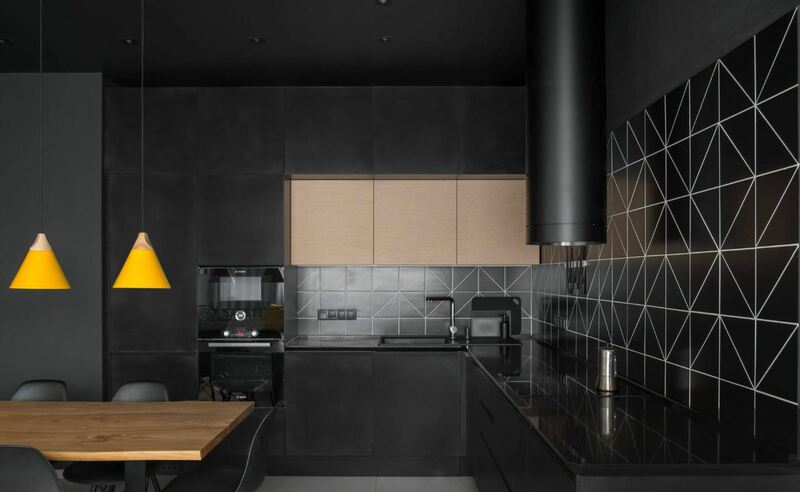 Take a chance and go to the other side of the spectrum: dare to visualize a kitchen decked in black. A black sink set up is a striking approach, bringing in contrast into the kitchen. It is an unexpected combination where the matte finish of the sink pairs nicely with the polished finish of the faucet. 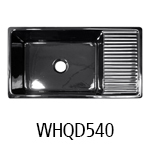 If you are thinking of black instead of white, Whitehaus Collection has the perfect black sink to bring your vision to life. All fireclay models are available in rich, deep Black, bringing the impressive beauty and outstanding quality of fireclay up in the chic scale. 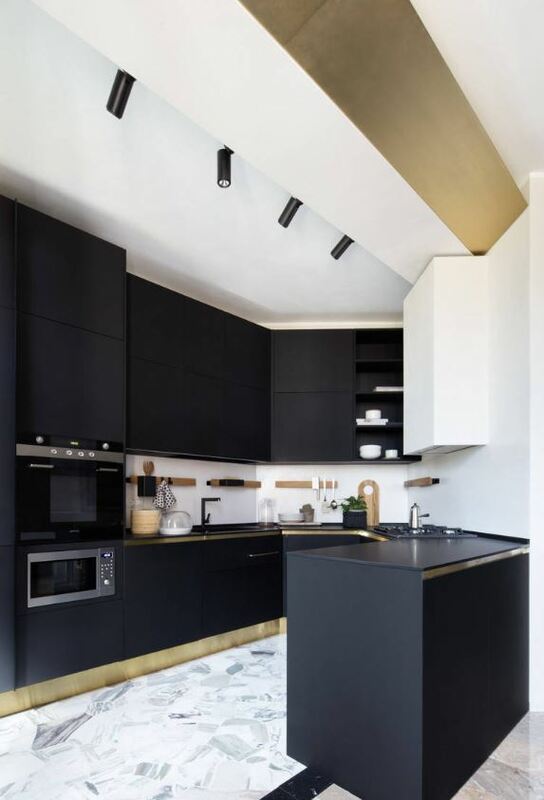 This modern, sleek kitchen design boldly combines black everything: countertops, walls; cabinets while adding cleverly placed details in natural wood and bright yellow, to break the visual palette. The drop-in black sink with integrated drainboard seamlessly becomes part of the countertop, keeping the sleek design outlines. The polished stainless steel faucet stands out, pulling the design together by matching the contrasting tiles. The 36″ WHQD540 Farmhaus Fireclay Quarto Alcove Series reversible fireclay sink has a decorative 2 1/2″ lip on each side with a integral drain board. This is the ideal size for all your kitchen needs. 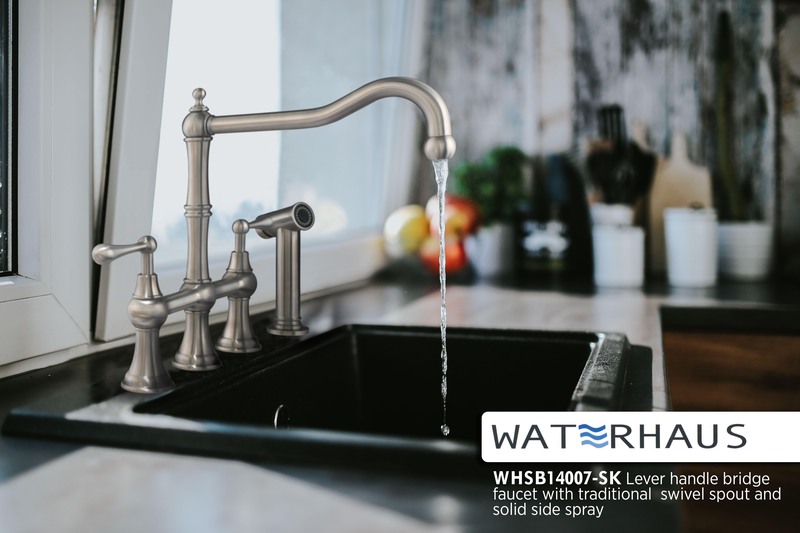 Whitehaus Collection’s Swanhaus is a kitchen faucet with clean lines and a pull-down spray head that comes free and locks into place with a quarter turn this faucet features two spray modes to gives you total flexibility. 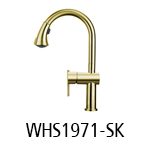 Made from solid stainless steel and built to last, The Swanhaus Faucet is 100% lead free, Watersense compliant and an exquisite choice for any kitchen. If you are looking to really shine in black, this combination of black and brass will do the trick. Perfectly black, seamless countertops and cabinets come to life with the polished brass floor board and ceiling trim. A thin brass frame running along the edges of the counters is the small detail that rounds up such glamorous combination of matte black and high polish brass. An impressive drop-in stainless steel sink in matte black is the perfect choice for this kitchen, a strong faucet to match all that brass around would be just what this kitchen needed. 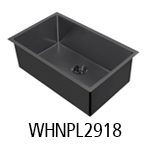 The WHNPL2918 Noah Plus stainless steel sink is constructed out of 16 gauge, industrial grade 304 stainless steel providing the highest quality, durability and resistance to corrosion. With its “near” zero radius corners cleanup and buildup remains at a minimal, keeping that pristine look as captivating as ever. This amazing stainless steel sink is equipped with rear center drain location, four diagonal groves for efficient draining and noise reduction dampening pads on all sides with full undercoating for maximum sound proofing and protection against condensation. As an added bonus, this sink set includes a matching sink grid as well as matching basket strainer for complete perfection. 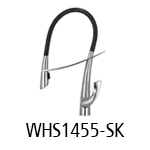 The Waterhaus WHS1971-SK is a lead-free, solid stainless steel, single-hole faucet with a goose neck swivel spout, lever handle, and pull-down spray head. 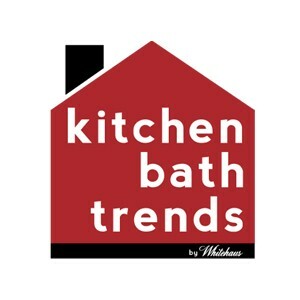 View Whitehaus Collection®’s full line of kitchen sinks, faucets and accessories.